Fall is here, and forget about pumpkin spice lattes — the thing I’m most excited for is finally putting on a sweater, wrapping myself up in a big down blanket and settling in by the fireplace. But before that happens? You’ve got to get rid of all the summer mess that’s still lingering in your home. Yes, you read that right. Most people think of spring as the time for seasonal cleaning, but after a few months of tracking in dirt from outdoor activities, dealing with the humidity and taking your beach towels, goggles and flip-flops out of storage, your home probably needs help. Never fear! Keep track of these essential fall-cleaning tasks, doing a couple each week before the cold weather really sets in. When it does, you’ll be prepared for a clean and cozy season indoors. It’s time to get your couch ready for snuggles! Wash your throw pillows and consider changing out the covers to something more seasonal. You’ll also want to wash any throw blankets you keep on your sofa and easy chair so the next time you reach for one on a chilly autumn night, you’re surrounded by cozy freshness. Some people don’t realize that curtains do in fact need to be washed. Especially after a season of soaking up humid summer air, curtains are especially prone to capturing dirt and dust and not letting go. At the end of the season, wash all your curtains. Better yet? After you wash them, store them and put up heavier curtains that will help insulate your home against the cold. If you’ve been going to the beach all summer, chances are there’s sand hidden everywhere. 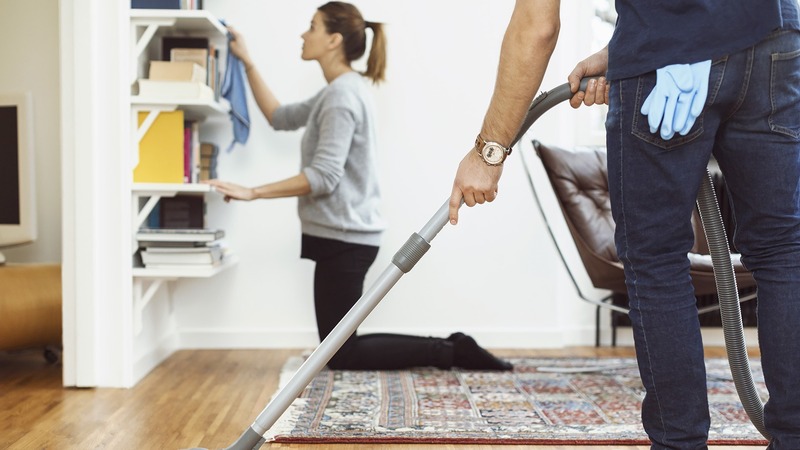 If you have carpeting, you’ll definitely want to thoroughly vacuum it, moving any furniture so you can really get under everything. If you have wooden floors, now’s the time to vacuum instead of sweep — the suction will help remove sand from the gaps between the floorboards. Make sure you vacuum area rugs and underneath them, too — they can trap a surprising amount of beach sand. And don’t forget your doormat — vacuum or clean the mat itself and sweep up any dirt and sand that’s hiding beneath it so it doesn’t get tracked into your home. It’s time to clear out some space so you have a place to keep your warm winter clothes, hats, gloves and coats. Stash away your bathing suits, beach towels, pool accessories, etc. — basically, anything you won’t be using once the weather changes. Wash and dry any clothes and linens before you store them, and make sure to label any storage containers so you can easily find your summer goods when you need to next year. After a long season in storage, your cold-weather linens can smell musty and dusty. It’s time to do a load — clean all your sheets, quilts and blankets and air out your down comforters by hanging them outside in the sun for a day (make sure there’s no chance of early autumn rain). Now’s also a good time to flip your mattress — give both sides a good vacuuming with an upholstery attachment to help get rid of any accumulated dust and grime. Cooking and baking is one of the best parts of fall, but you’ll need to make room for all your culinary creations. Go through your fridge, tossing any expired items, wiping down the shelves and cleaning the crisper drawers. If you have a fireplace, you’ll need to get it ready for the cold months ahead. Have a professional chimney cleaner come in to inspect your chimney and remove any flammable buildup. Check your chimney and fireplace for any cracks or loose stones, check the damper to make sure it can open and close and make sure to trim back any branches outside that are too close to your chimney. With colder weather comes lots of outerwear. Take time to organize and make space for your coats, mittens, hats, boots and umbrellas now before you start using them. That way, you’ll avoid having a jumble of clothing and shoes right inside your door once cold weather hits. Your heating vents have been off all summer, and chances are they’re covered in dust and grime. Now’s the time to clear them out so when the heater turns on for the first time all year, you don’t find yourself choking on the dust in the air. Use a soft duster on both electric heating elements and on forced-air heating vents, breaking out the vacuum and its various attachments for any that seem particularly stubborn. When the cold weather finally arrives, you’ll be totally prepared — and ready to snuggle down in your sparklingly clean home.